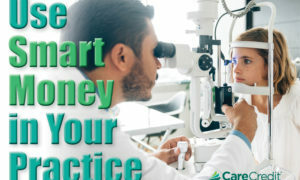 A marketing image used to promote Dr. Gill’s practice. Dr. Gill tries to carry over her fun, Millennial-friendly branding from online into the in-office experience. When patients need new eyewear, the first impulse is to search online. When it comes time to make a purchase, however, they hopefully will arrive at your office. Here is how my three-OD practice, Oakland Vision Center, ties online promotion of optical services and merchandise to the experience we deliver in-person. 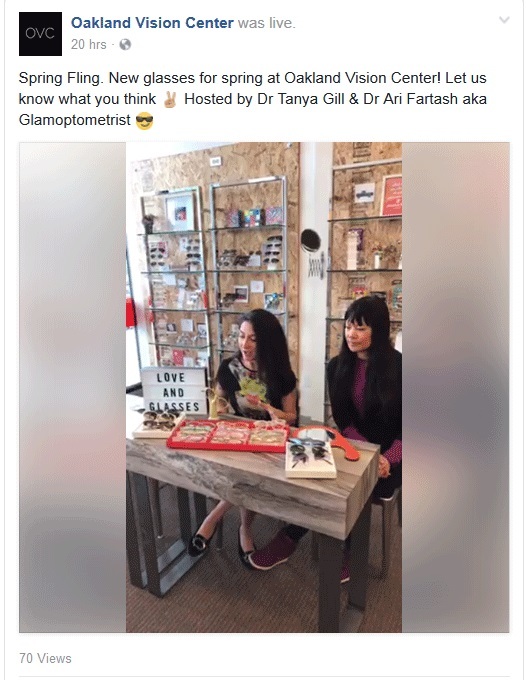 Dr. Gill says one of the ways her practice, Oakland Vision Center, shows patients the excitement of products online is by posting rich media like this video to Facebook. 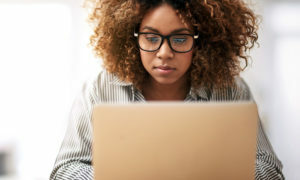 The eyewear your patient comes to your office having viewed online is influential, but more influential is the conversation you have with them in the exam room. Most of my prescribing happens during the eye exam. I like to observe my patient, and see what works, and what can be improved. Often the physics of a glasses prescription, and the physics of lenses and materials, determines a successful, clear result. For example, ZEISS’s computer progressive for relieving eyestrain, ZEISS Officelens, has really increased the happiness level with my patients. And that is something that is elicited during the eye exam. If the patient/customer wants to purchase online, I emphasize how much I would love for them to support my local business, and ask them for the opportunity to win their business. Sometimes it’s a win. Sometimes it’s not. But the most important point is to communicate to the patient/customer that you want their business, and that you can provide greater personalized, and higher-quality service than they will receive from an online, or mass, retailer. I then bring the patient to the optical, reviewing with the optician and the patient what I have prescribed and why. 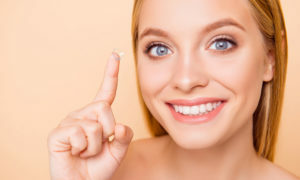 This is an essential step, as without my hand-off, a prescription is just a bunch of numbers. The optician can show the patient in the optical how my prescription, using personalized lens technology from our partner, ZEISS, such as the ZEISS Progressive Individual2 with EyeFit technology lens, has given them a unique solution for a unique individual. Most customers love digital lenses once they are explained properly, and we usually find they are happy to pay more for better clarity. The cheapest glasses online are very much like over-the-counter readers in the drug store aisle. Many people are willing to compromise vision for price. But many others will pay more for performance, as long as they feel like they are getting value. Like Mercedes Benz says, “The best or nothing.” Once you’re driving behind the wheel of a Benz, it’s hard to go back to your regular ride. 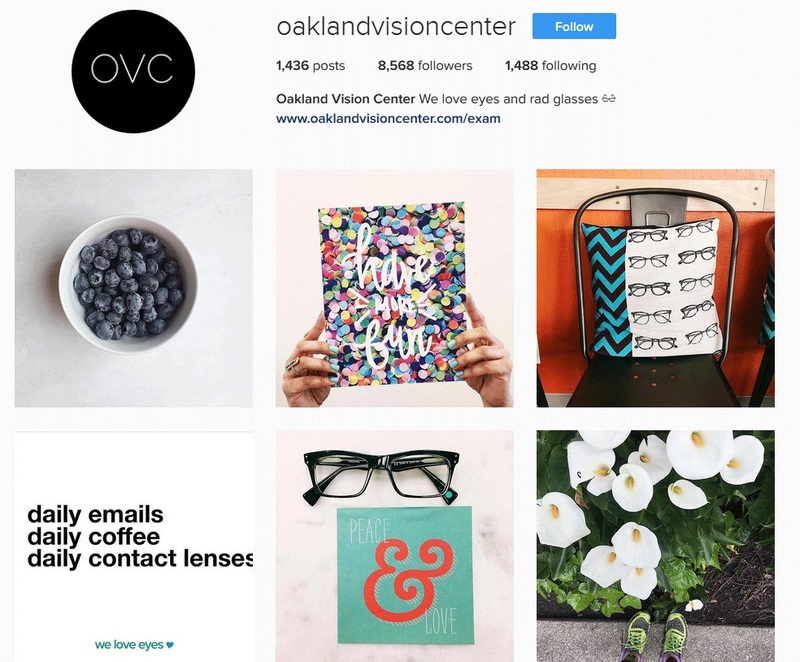 Oakland Vision Center’s Instagram page. Dr. Gill says a strong online presence on sites like Facebook and Instagram help the practice market itself to Millennials. My optical definitely has the personal touch with unique, high-quality products. We communicate that to our audience with our strong online presence. Our web site has unique, memorable copy-writing and gorgeous high-resolution photos. High-resolution photos are key because they speak clarity, which is important, as we are after all, in the business of selling clarity. Our social media has a strong following, and we showcase our products (glasses and lenses) with beautiful images without being overly salesy. So, before a patient/customer steps into my practice, most of the selling has already been done. They have been sold the brand story. We also utilize a lot of picture drawings of progressive lenses to illustrate the benefits, and will also sometimes link to information from our lens partners, like ZEISS, to provide specific information about our products. This also helps to set expectations as one pair of progressives does not solve all problems. This aids in the multiple-pair sales. 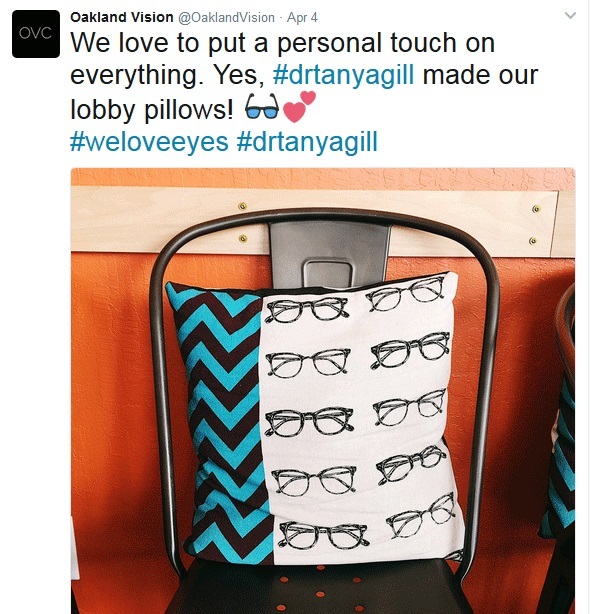 A pillow that Dr. Gill made herself, posted to the practice’s Twitter page, and promoting the message of personalized service at Oakland Vision Center. That personalized service includes personalized lens technology from ZEISS. I believe that selling your personal brand story is more important than advertising any frame or lens brand. You must have unique, quality frames and lenses, but let’s be honest here, Millennials (my target audience on social media) do not care about logos or brands. 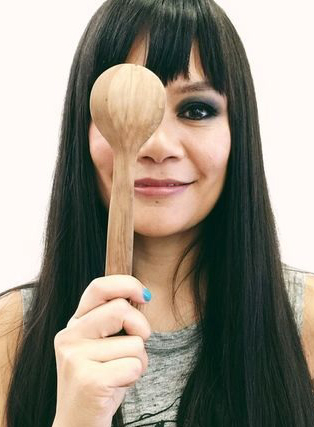 They love brand stories, and need to feel connected before making a purchase. The best thing I ever did for my optical was remove the frame posters and replace them with personalized “We Love Eyes” and “Rad Glasses” signs. 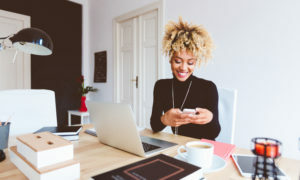 Online retailers do an exceptional job of buying online advertising (with unlimited budgets) and building brand stories. Most independent eyecare professionals’ web sites and social media pages cannot compete. Not because we are not capable, but mostly because ECPs choose not to put much energy into telling their brand story through their social media. It’s extremely time consuming, and most ECPs just don’t know where to start. Often, an independent ECP will let one staff member run their social media without much guidance from the owner. Online retailers have laser-focused social media campaigns that are well thought out and executed. In our practice, we have a multi-step system that allows us to create and tell our brand story: Ideas, photography, copy-writing, curation, approval, disapproval and execution. There are many people involved in making a successful social media campaign happen. The last component is making the online brand story match the experience the customer will have when he/she walks into your business. Communicating brand story to brand feeling is a powerful thing. It creates brand loyalty and happiness. It’s like watching a Harry Potter movie and experiencing it come to life at Universal Studios. Because, magic. As advanced and high-quality as your lenses are, you risk losing a sale if your frames aren’t appealing and exciting. Frame displays are key. My husband made frames displays out of oriented strand board, which really gives our displays an authentic, organic vibe. And, yes, an OSB board costs just $13! Trying on glasses becomes a comfortable experience, and my opticians use that time to get to know and educate the customer about lenses, computer eyestrain and UV protection. We have a wall of 250+ frames to compete with online retail options. 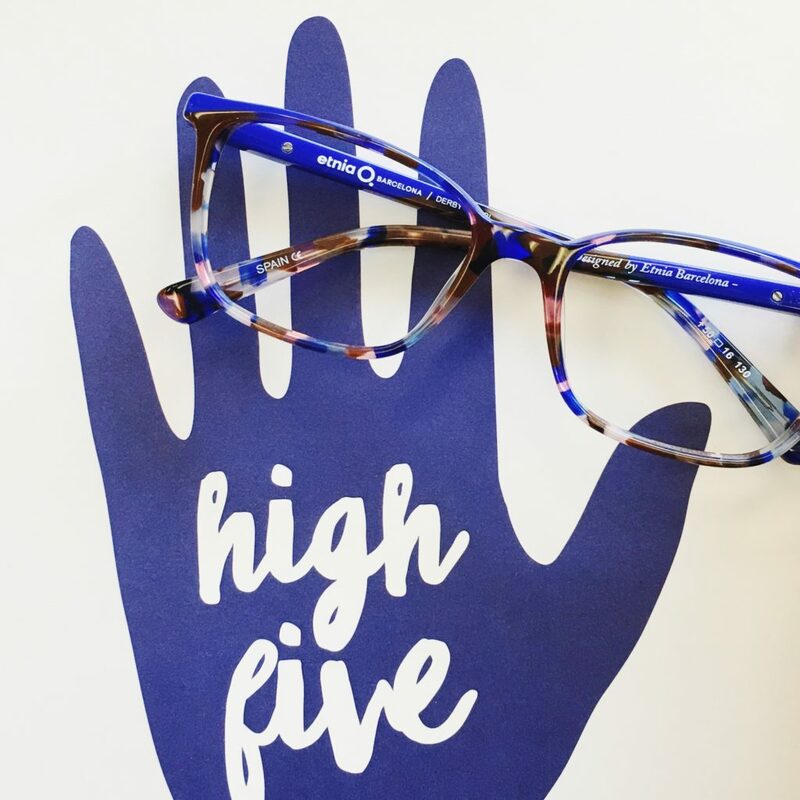 The frame, lens and anti-reflective (AR) coating are all priced competitively, offering our patients a quality experience that online, and mass, retailers can’t match.